My meme was well above my views benchmark with 1,666 views as of this blog post. As for Engagement Rate, my Twitter Card received 32 clicks out of 1,347 impressions (2.38%), so I fell a bit short on this objective. My Imgur tags and Reddit posts got me most of my meme views. I had ~440 views after posting on Imgur and gained roughly 1,000 more after posting several times to Reddit. My content wasn’t particularly well-received on either site according to their upvote metrics, but I still got a lot of eyes on the meme. Better audience targeting could have led to an even higher view count if users had actually enjoyed and upvoted my meme. My Twitter campaign seemed a little lackluster. I think that my webcard copy could have been stronger. My image was also formatted a bit strangely, so I could’ve benefitted from changing that. I would’ve liked to have seen greater engagement on my promoted tweet, but I am impressed that it was seen over 1,300 times. Though it didn’t work out well for me in terms of engagement, it’s easy to see how Twitter could be a strong and viable platform for awareness marketing. Love your meme! I had similar results with Twitter and also experienced a huge organic viewer base from Imgur. Love your creativity! This is honestly one of my favorites memes. I find it absolutely hilarious, so great job implementing so much comedic relief within it. You received great engagement numbers, too! 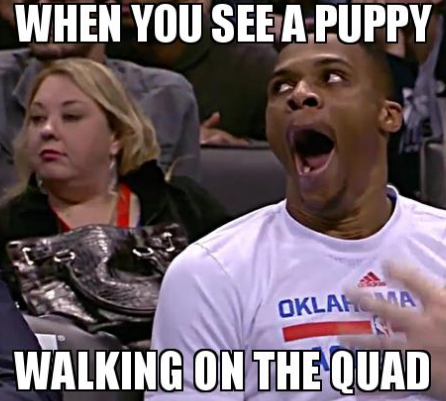 I love this picture of Westbrook and he’s definitely allowed us all to create some great memes around it, but yours is my favorite! Awesome job!